Notice and agenda filed in the office of the City Clerk and posted at City Hall at 3:30 p.m. on Friday, March 30, 2012. A. Approval of March # 2, Payroll in the amount of $40,066.05. B. Approval of Claims in the amount of $73,947.87. C. Approval of Minutes from March 19, 2012 Regular Meeting. D. Approval of Cemetery Deeds: James or Debbie Applegate, 2 spaces; Charles or Carrie Schmitt, 2 spaces; Tracy Starr, 1 space. F. Approval of Budget Supplemental in the amount of $2,852.53 for OHSO Grant Dec 2011 to Jan 2012: Police Department. G. Approval of Budget Supplemental in the amount of $507.92 from Revenue Rescue: Fire Department. 7. Report from Tulsa Metro Chamber of Commerce. 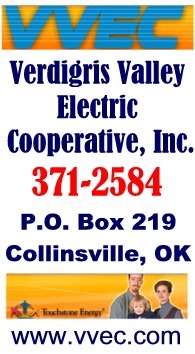 -- Justin McLaughlin reported on activities the Tulsa Chamber has done in regards to the regional economic development cooperative Collinsville participates in with Tulsa and several other communities in this area (for $5K). 8. Discussion and possible action to approve the contract for sale of surplus city real estate to James Roderick and authorize the Mayor and City Clerk to sign the deed and other closing documents to finalize the transaction. -- Approved. Mr. Roderick indicated the new feed store on the sale barn porperty would open in approximately 2 weeks and expects folks to be plesantly surprised by the building's vintage interior. 9. Discussion and possible action for approval of replacement of Dispatch Communication Console Center in the Police Department. Total cost $19,572.88. -- Approved, the new Motorola computer based system will replace the recently failing system (which survived the 2001 fire in the old city hall police site). Collinsville also supplies dispatch services for Limestone and has been using workaround capabilities pending the arrival and installation of the new system. * New ambulance should be in servive in a week or two following state inspection after it is all decked out. * Depot Museum meeting with Bill Thomas and Ron Evans. Many items will be boxed up and stored while repairs and painting take place. * The First Baptist Church removed another house (at 13th and Center) and will be making major building / parking changes soon. * Fire and police negotions have begun. * Police station flooring upgrade about half done. * Budget meetings continue with city department heads. A. Approval of March # 2 Payroll in the amount of $26,330.98. B. Approval of Claims in the amount of $87,544.83. 5. Discussion and possible action for approval to purchase ¾ ton truck for the Electric Department. State contract price of $26,170 from Mathews Ford Broken Arrow, Oklahoma. -- Approved. The 1969 pole truck was already budgeted to be replaced and those funds will be used for this new pickup. Local bids for a similar used vehicle either didnot match the specs or were more expensive than new according to Phil Stowell. * 6 residential building permits in past month (19 total for year so far) .. ahead of most local communities. * Rain slowed S-Curve work ... sub-base was in before rain on south side ... and asphalt was slated for Tuesday ...more rock on 19th street intersection ... more curbing work soon. * North side lift station rehab -- new pumps arrived to replace 1 failed and 1 under performing. Completion expected in about 40 days and a spare pump available also. $26K Truck For Electric Dept.